Micrococcal nuclease (MN) catalyzes cleavage of both DNA and RNA to yield 3'-nucleotides (Alexander et al. 1961). MN is the extracellular nuclease of Staphylococcus aureus. Strains V8 and Foggi yield almost identical enzymes (Cusumano et al. 1968). A surface-bound nuclease has been purified by Okabayashi and Mizumo (1974). MN was first reported by Cunningham et al. (1956) and crystallized by Cotton et al. (1966) and Sulkowski and Laskowski, Sr. (1966). It has been extensively studied by Anfinsen's group. Of particular interest is the limited tryptic digestion of MN to yield three peptide fragments two of which can reassociate to yield an active complex, nuclease-T (Taniuchi, Anfinsen and Sodja 1967; Taniuchi and Anfinsen 1968). Taniuchi et al. (1972) reported the x-ray diffraction pattern of nuclease-T crystals. See also: Sanchez et al. (1973), Chaiken (1972), Chaiken and Anfinsen (1971), Parikh et al. (1971), Taniuchi and Anfinsen (1971, 1968). 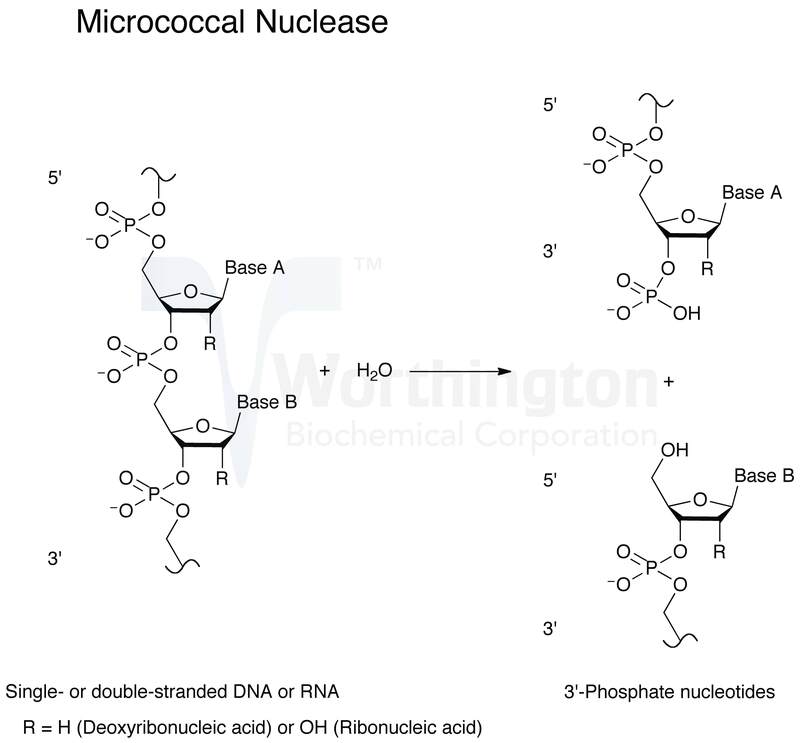 The specificity of hydrolysis attributed to micrococcal nuclease makes it a useful tool in the elucidation of nucleic acid and oligonucleotide sequence studies. Axel (1975) and Sollner-Webb and Felsenfeld (1975) have reported on MN cleavage of nuclei and chromatin DNA and Bode and Gillin (1971) on its effect on tailless phage heads. Molecular weight: 16,807 (Taniuchi et al. 1967b). Composition: The amino acid sequence has been reported by Cone et al. (1971). The active site has been reported on by Chaiken and Anfinsen (1971), Cuatrecasas (1970), and Cuatrecasas et al. (1968). See also: Furie et al. 1973), Bonhert and Taniuchi (1972), Sacks et al. (1972), Arnone et al. (1971), Epstein et al. (1971), Chaiken and Anfinsen (1970), Cohen et al. (1970), Markley et al. (1970), Putter et al. (1970), and Schechter et al. (1970). Optimum pH: The pH optimum is reported as 9.2. However, the enzymic activity has an absolute requirement for Ca2+ and the pH optimum varies according to Ca2+ concentration (Heins et al. 1967). Extinction coefficient: = 9.2 (Fuchs et al. 1967). Activity: Ca2+ is essential for activity. (See, however, Frank et al. 1975). Both RNase and DNase activities are competitively inhibited by deoxythymidine 3',5' diphosphate (Cuatrecasas et al. 1967). Sulkowski and Laskowski, Sr. (1970) indicate that the kinetics of degradation of RNA and DNA differ. They found no activation with Sr2+. See also: Dunn et al. (1973), Rammler et al. (1972), Chaiken and Anfinsen (1971), Markley and Jardetzy (1970) and Mikulski et al. (1969). Specificity: Exhibits both exo- and endo-5'-phosphodiesterase activities against both DNA and RNA (Alexander et al. 1961). The enzyme catalyzes preferential endohydrolysis of the RNA and DNA at sites rich in adenylate or uridylate and deoxyadenylate or thymidylate (Roberts et al. 1962; Rushisky et al. 1962). Inhibitors: 5'-dioxynucleotides and 5'-ribonucleotides are inhibitory with the former demonstrating greatest inhibition. Stability: The Worthington preparation is stable for at least 6-12 months at 2 - 8°C. Concentrations of 4 micrograms per ml of the purified enzyme made in 0.1% albumin are stable for at least 2 days at 2 - 8°C.